What I lacked in progress today, I more than made up for with stress. The day started easy enough. I simply added bamboo pegs to all of the draw joints. Yep, it is overkill, but it is how I like to put drawers together. I doubt that I will ever have to worry about one of my drawers coming apart. The process is simple. Cut up a few bamboo skewers, drill a few holes, add a little glue and knock the pegs into place. The important thing is to drive them slow. This allows everything to adjust and lessens the chance of causing a split. All pegs are installed and no splits. Here is where the stress began. The next process I tackled was to drill and then ream the sockets for the legs. Sounds simple right. Here is the thing. There is no way to hide an angular error. It is either right, wrong or close enough to look right. As the leg increases in length, any error is magnified. So I set my sliding bevel to the resultant angle (16°) and taped it along the sight line. Then I carefully drilled a 5/8″ while trying to keep the bit aligned with the sight line and running parallel with the bevel gauge. Once all the holes were drilled, I began the reaming process. This is where the stress level ramps up several notches. One revelation of the reamer is enough to throw the whole thing out of whack. So I used a test dowel to check my progress every few revolutions. You can make corrections by “steering” the reamer as you turn the brace. I managed to get through all eight sockets without any major problems. Slight corrections when needed here and there. All in all I felt pretty good with my results. Here is where the stress went through the roof. I test-fit the legs into the first top and set it on the floor. It looked OK, but I could see a couple of legs where slightly off and would need some adjusting. 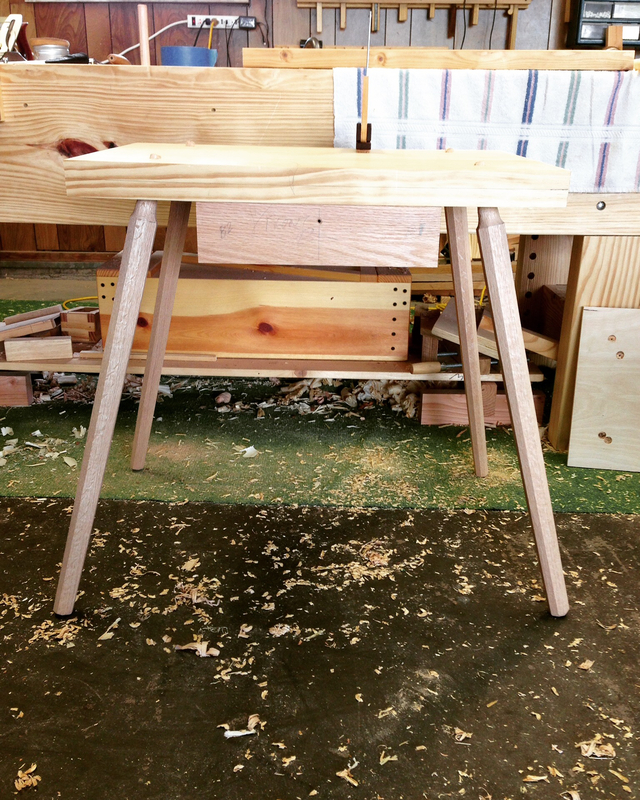 I then test-fit the legs into second top and set it on the floor. One leg on that assembly would need attention. It was when I set the two assemblies back-to-back that I just about had a stroke! They were waaay off from each other. What the…. So I began marking the offending legs and started adjusting their sockets with the reamer. A little better, but the errors seemed to move around on me. I came dangerously close to ruining both tops before it dawned on me what the problem was. I mean dangerously close. Anyway, it finally occurred to me that a couple of the tenons must be slightly out of plumb. It was hard to find, but sure enough, I had a three tenons that were out of plumb. Whew…the simple solution was to twist the legs in their sockets until they looked “right”. If I was building just one table, I doubt that it would have been such a dramatic issue. But comparing the two tables seemed to compound all of the errors. I think everything will be fine though now that I know what I’m looking for during final assembly. Here are the two tables side-by-side. I still need to tweak the legs a little, but not too bad. 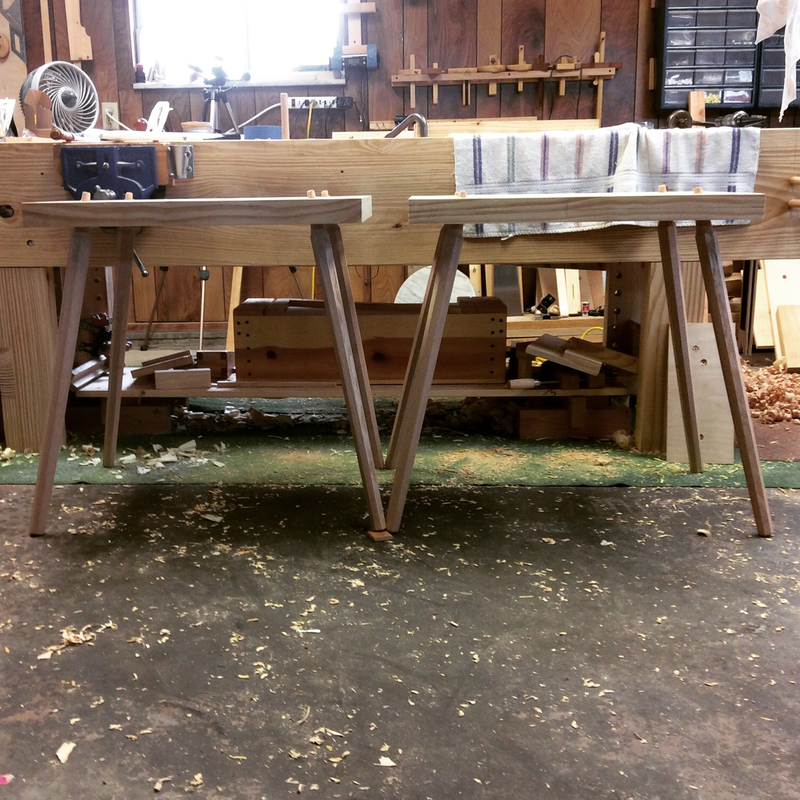 Here is one of them with the drawer clamped in place to get an idea of the eventual finished table. Hopefully over the coming week I will be able to dress the edges of the tops and maybe install these legs permanently. I still need to fabricate the drawer bearers and subsequent runners. The temperatures are supposed to be mild this week so maybe an hour or so in the shop after work a few days this week won’t be out of the question. 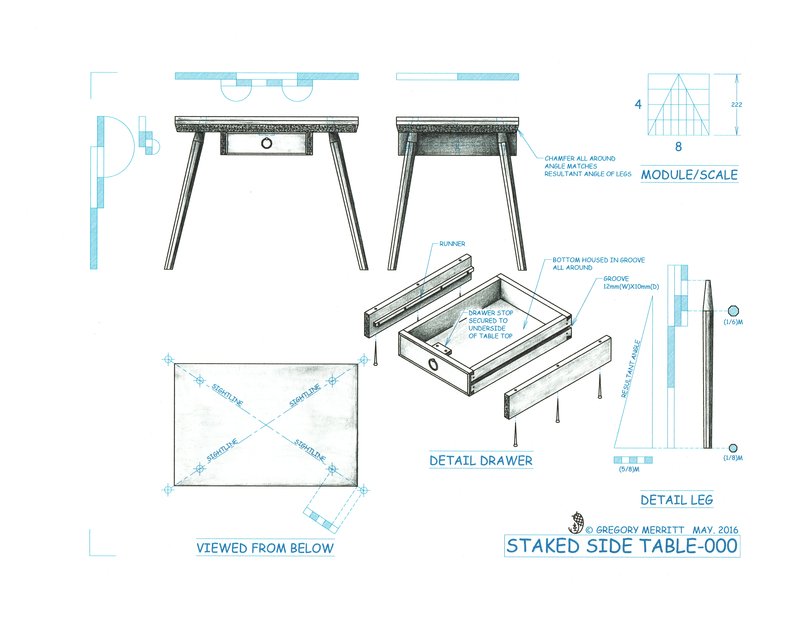 This entry was posted in Staked Side Table-000 and tagged reamer, resultant angle, sight lines. Bookmark the permalink. Of course my reamer was a modified pencil sharpener but besides that…. all was identical just in fractions of millilitres… It is nerve racking!!! The other day I read in Peter Follansbe blog that, during the test fit, he puts a mark inside the leg and the bottom piece when the fit is right. 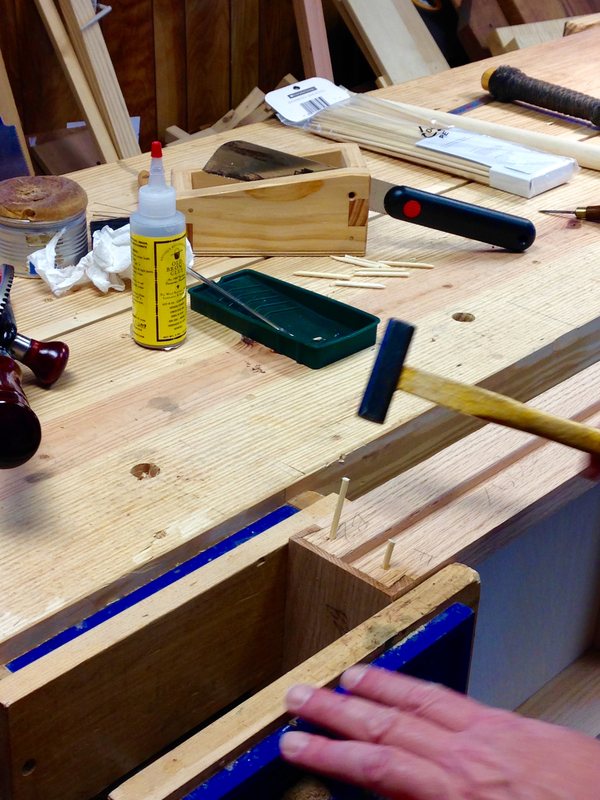 That way he make sure about the rotation of the tenon. It will make you old quick until you get your head around it. Now that I know what I need to do I’ll take some time and move legs around until I get the best configuration. Then I’ll mark them. Next time I’ll know what I’m looking for from the start. I think if one could make all their legs on the lathe, they would all turn out the same. But, I have learned same as you, that getting those tapered tenons perfectly symetrical isn’t so easy without a lathe. I love that a tapered reamer allows for some last minute adjustments, and I have found that testing the angle during reaming with the actual leg is helpful in getting those angles just right. These tables are looking great! I still have to try it, but I have been toying for some time with the idea of trying different positions of the chuck of my cheap drill press to minimise the wobble. With luck innacuracies might compensate one another. Nice work Greg! Rustic pieces with so many variables are enough to drive the perfectionist a bit crazy. Thanks so much! This is a learning experience for sure. I think I’m starting to get a handle on it though…maybe. Thanks Derek. Hopefully it will be downhill and easy going from here. At least I can hope it will be. I’m guessing that Schwarz’ book on staked furniture didn’t cover this issue. We can file this on under “the stuff they don’t tell you”. Made the same experiences with building my stool. But that is the fun part for me. This are handmade pieces and they never will be 100% equal. Nevertheless this journey is somehow exciting. The tables are looking pretty good so far. Curious to see how they will come out. This is a different process for sure. But I agree, lots of fun. I think we are both getting a better understanding of how all of the parts work together.